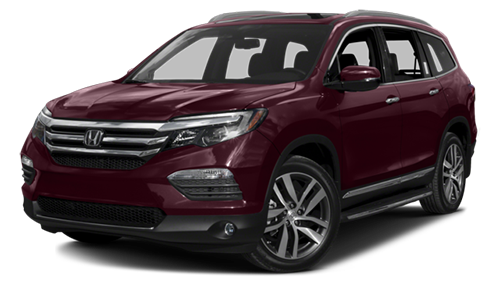 The 2016 Honda Pilot is in stock here at Brilliance Honda of Crystal Lake, and if you’re looking for a three-row family vehicle that offers plenty of upscale features and high-tech safety, then the Honda Pilot Elite is for you. The Elite is the top rung in the Pilot lineup, meaning it comes packed full with luxury features. Find out more below! The 2016 Honda Pilot Elite comes standard with a nine-speed automatic transmission, while the lower trim levels in the lineup use a six-speed automatic transmission. It receives the same direct injection 3.5L V6 as the rest of the lineup good for 280 hp and 262 lb-ft of torque. All-wheel drive comes standard, so you can expect 19 mpg city/26 mpg highway/22 mpg combined*, according to EPA estimates. It also comes with a traction system with snow, mud, and sand settings. The 2016 Honda Pilot Elite comes standard with the Honda Sensing suite of high-tech safety features. That means it comes standard with important features including adaptive cruise control, automatic collision prevention braking, forward collision warning, lane departure monitoring, and lane departure prevention. It also comes with features like anti-lock brakes, a rearview camera, and traction and stability control. Come check out the ultimate in luxury with the 2016 Honda Pilot Elite, along with the rest of the Pilot lineup, here at Brilliance Honda of Crystal Lake, IL. We’re proud to be your leading Elgin area Honda dealership, and we’re located at 680 W. Terra Cotta Ave. in Crystal Lake, IL. Come visit us today!